Even though I am primarily a science fiction modeler, I have a serious soft spot for World War I armor. That's where this kit comes it. In the last few years, a couple of model companies have been putting out some wonderful First World War kits and I've had my eye on a few of them. On a whim, I decided to pick on this fantastic offering from Takom. 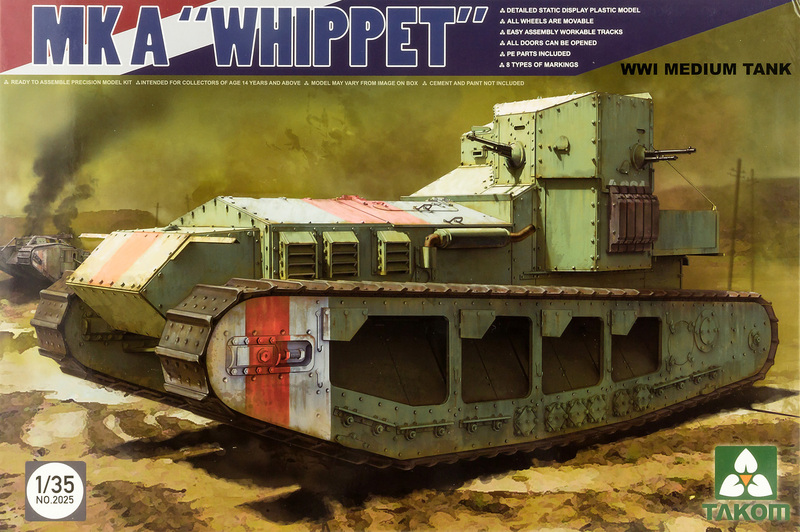 The Medium Mk.A "Whippet" was Britain's first medium tank, intended to compliment the slower heavy tanks. With a crew of three and armed with four .303 Hotchkiss Mark I machine guns, this tank had a top speed of a blistering 8 mph, making nearly three times as fast as its heavy tank cousins. First entering service in 1918, they proved effective at covering the fighting withdraw of British infantry division during Germany's Spring Offensive in the tail-end of the war. After the war, they continued to serve the British Army until 1930, seeing action in Ireland during the Irish War of Independence (1919-1921) and as part of the British Expedition in support of the Whites during the Russian Civil War. 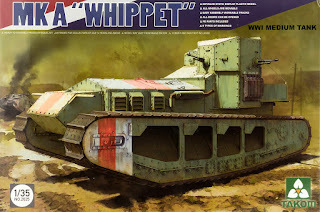 On the real Whippet, the idler wheel was adjusted with a bolt and was used to tension the tracks. Takom has given us the option of positioning of the idler wheel in the places: all the way in, the middle, and fully extended. I chose to go with maximum extension because I think it looks the coolest. The problem is that the bolt and nut used to do this on the real thing, though finely molded on the model, is positioned in all the way in. To fix this, I removed the bolt and cut a piece away. Then I carefully sliced off the nut and washer. Finally, I drilled a whole where the channel would be and inserted a piece of styrene to simulate the bolt in its housing. On two of the four bolts, I didn't cut the nut and washer away clean enough so I had to scratch build a washer out of thin sheet styrene (I didn't have any rods small enough). They will be painted to resemble bare steel to simulate a lost factory washer replaced in the field by a handmade one. Now on to the most painful part of an armor build: the running gear! This model, like most tank models, has a ton of pieces. Each track has sixteen road wheels and five return wheels each made of three pieces plus a drive sprocket and an idler wheel each made of two pieces. Luckily, they're mostly hidden so there is very little clean up needed. In fact, a majority of the road wheels could be left out and it would look just fine. To simulate the asbestos wrap that was around the exhaust pipe, I used a piece of fine thread and secured it with super glue. I also drilled out the shroud for the exhaust and extended the kit piece with a small piece of styrene rod to make it look as if the exhaust pipe is actually coming from the interior of the tank. I cut off the molded on brackets and replaced them with thin wire. It was a good feeling to get the side pieces and the bottom of the fighting compartment together because now it's starting to really look like a tank! I was feeling pretty good about the whole thing until I hit my first really snag: glue fingerprints. I really do like Tamiya Extra Thin Cement but the problem is that having to hold parts together while gluing them can cause problems, mainly fingerprints! The fit of the fighting compartment is okay for the most part, but the issue is that it's made of multiple different pieces that all have to be glued together at the proper angle. While holding it in place, with pressure to ensure a proper fit, some glue leaked from the joint and left a nasty fingerprint on this armor panel. I had to let the glue dry and then sand everything as smooth as I could, which meant I had to remove the rivet detail. After replacing the brace with a piece of strip styrene, I started adding some extra rivets that Takom was kind enough to supply with the kit. They're larger than the molded ones, but it's better than nothing. Since the surface isn't as nice as I want, this section will get a little extra weathering to hide my mistake.